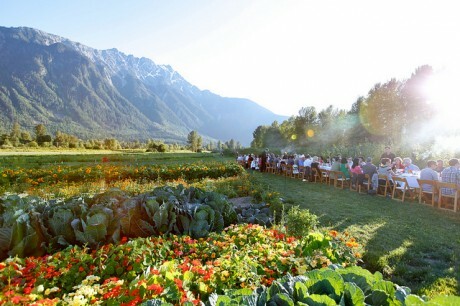 When I heard that Araxi was putting on a long table series in the heart of Pemberton I was intrigued. After asking a few foodie questions I grasped the magnitude of this so-called “dinner” and knew without a shadow of a doubt, come hell or high water, I needed to find a place at that table. Less than 48 hours later I was driving the winding and glorious road to Pemberton and onward to North Arm Farm – nestled at the base of Mount Currie – to take my place among 110 other diners. Upon arriving at the farm dinner guests were greeted with cocktails and wine and the first round of appetizers were passed. We then made our way to the farm tour. It was really hot and as sweat poured, make-shift fans waved and water was guzzled, Jordan Sturdy (coincidentally the Mayor of Pemberton and the son of designer Martha Sturdy) shared farming practices that make North Arm Farm unique. During the tour I sipped a 2008 Trefethen Dry Riesling and nibbled on a Yarrow Meadow Duck Liver Parfait – so delicious. As we walked the fields I couldn’t help but notice that there were weeds and bugs everywhere. Sturdy explained that organic farming allows nature to take its course and they don’t pluck weeds from their crops or use any kind of pesticide. It allows nature to do what nature does naturally. I like this. Making our way to the table I gasped. It stretched almost the length of the field and it’s white crisp tablecloth, silverware, plates, and beautiful assortment of glasses and bright floral centerpieces teased me to what was about to come. 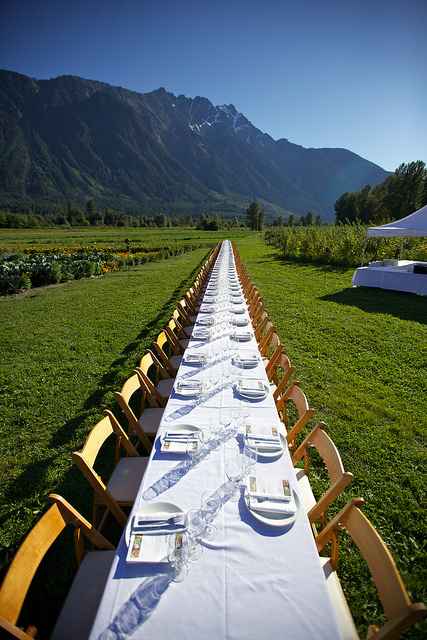 As I looked at Mount Currie, the fields, table, the other guests, I couldn’t help but feel like I was in a movie – it was completely cinematic. My dinner companion and I chose spots and got acquainted with our neighbors who turned out to be none other than “Jack” and “Araxi” from Araxi. They were such lovely, humble, yet playful people who contributed greatly to our shared experience. I asked a few questions about their life in and out of the restaurant industry and grasped a good sense of the passion for food and culture that has made them so successful. Now let’s talk food. While the location was “picture perfect” the food was the shining star. 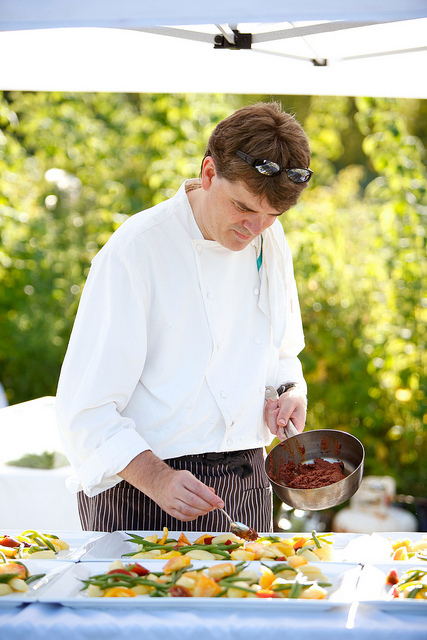 Araxi’s Executive Chef James Walt could not have prepared a better menu to truly showcase the flavours of British Columbia –using ingredients from, “nearby woodlands, pastures and shores”. If you know me you’ll know hands down I hate beets. To me they taste like dirt – but not the North Arm Beet Salad. The beets were sweet like candy yet had that rich “fresh from the garden” flavour. The menu described the dish as: North Arm Beet Salad with buffalo mozzarella, beet chips and spiced nuts, organic olive oil and lemon vinaigrette. This was paired with a Foxtrot Chardonnay. It was such a beautiful dish and made me a beet believer. The second course was unique, simple, yet blew my mind – Wild BC Tuna ‘Nicoise’. Picture buttered field potatoes, perfectly prepared green beans, tomato salsa verde with a gorgeous quail egg and olive tapenade. In a word “amazing”. However the main dish I am still dreaming about today was – Heritage Angus Natural Beef. It was described as: Crispy slow cooked beef cheek fritter, pepper and rosemary roasted fillet with North Arm onions, Swiss Chard and baby onions. Beef cheek fritters – I don’t think I’ve ever had something so delicious…truly. The desserts were “sweet” in their own right – cherries with chocolate dipped ice cream bars, pistachio cake, and an assortment of macaroons and homemade jellies. They were the perfect ending to a fantastic meal. In appreciation, our table of 110 partook in the “wave” ending in cheers and celebration for an evening of gastronomic delights – this was my kind. The next morning I was pinching myself. Did I really just have that incredible dining experience? Did I really eat under the protective gaze of Mount Currie, and sample exquisite cuisine nestled among berry bushes and rows of beautiful organic vegetables? I had indeed. Some girls dream of being a princess – this one dreams of long tables, exquisite food, and 110 + guests. Partnering on the event including the Araxi team and North Arm Farm, were Foxtrot Vineyards, Trefethen Family Vineyards, Pilliteri Estates Winery, The Wine Syndicate and Pemberton Distillery. The heavy hitters of the evening were Araxi Executive Chef James Walt, Pastry Chef Aaron Heath, Restaurant Director Neil Henderson, and Wine Director Samantha Rahn.